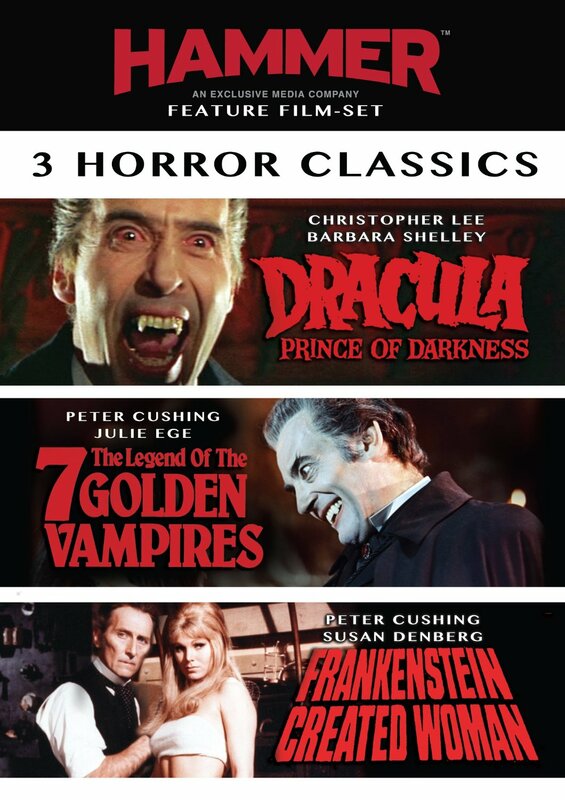 Well, the old adage goes you get what you pay for, and Millennium Entertainment fumbled their new, cheaply priced, and entirely extra-less Dracula: Prince Of Darkness (1966), The Legend Of 7 Golden Vampires (1974), and Frankenstein Created Woman (1967) triple feature. 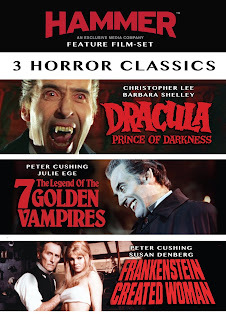 Several firsthand reports are indicating that 7 Golden Vampires, although sporting an anamorphic widescreen transfer, is marred by speed-up resembling the 3% increase in framerate that comes with the 25 frames-per-second PAL video standard versus the 24fps NTSC standard of this presentation. If this is the case, it actually isn't a problem that's uncommon, but it still deserves to be rectified. This DVD still plays fine in U.S. players; it's just the source of the transfer was PAL and sloppily converted into NTSC standard leaving the faster motion and probably a higher pitch to the sound. Although it should be said that with bad PAL-to-NTSC transfers also usually comes strange, lagging "ghosting" digital artifacts. To be honest, and I know some will strongly disagree, I've found that unless you've seen a particular film a decent amount of times in NTSC, the slightly faster motion and audio of viewing something in PAL is rather difficult to notice. I say this owning many PAL discs and an HDTV and DVD player that can display them without any conversions. However, if an improper video conversion isn't the issue here, I'm unsure what it could be. If Millennium doesn't announce a fix pronto (doubt they will at all myself), I might eventually pick up a copy for Terence Fisher's Frankenstein Created Woman. For those that don't know, Anchor Bay's Hammer Collection DVD release from back in 2000 is perhaps their most infamous botch in their history as a video distributor. Due to a widespread faulty pressing at the disc replicator, virtually every copy that shipped out was completely unplayable. Instead of the dual layer disc being a golden color, it's a reddish bronze, leading to the term "bronzed" on forum posts upset about the problem at the time. Only their quickly recalled and corrected THX disc of Dario Argento's Opera (1987) the following year rivals the scope of the problem with their never fixed dud Hammer.